Accurate control of combustion efficiency is a mainstay of fired boiler and other combustion operations. Reliable measurement of oxygen concentration in flue gas enables adjustment of the fuel to air ratio to produce efficient combustion, reducing cost and environmental impact. Since O2 sensors are located on an exhaust stack, generally a difficult location to access, high transmitter reliability and low maintenance requirements are beneficial. The Oxymitter™, from Rosemount Analytical (div. 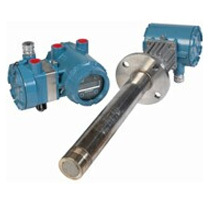 of Emerson Process Management), is an in situ oxygen transmitter well suited for use in monitoring flue gas. The transmitter is applicable to all new installations and adaptable as a replacement for existing units. The zirconium oxide based sensing technology, along with advanced design, provide a host of useful features. The data sheet included below provides additional detail for the Oxymitter™. Share your combustion control challenges with product application specialists. A combination of your process knowledge and their product application expertise will produce an effective solution. In Situ Oxygen Transmitter For Combustion Monitoring from Hile Controls of Alabama, Inc.